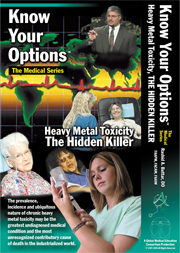 This program contains the information from Dr. Buttar’s seminar used to educate patients on heavy metal toxicity and the impact on chronic disease. 8 out of 10 deaths in the US are due to cancer and/or heart disease. This is especially disturbing when considering both heart disease and cancer have been clearly associated with chronic heavy metal toxicity. Other chronic diseases associated with heavy metals include stroke, vascular disease, neurodegenerative conditions, autoimmune diseases, fibromyalgia, and a host of other medical conditions.